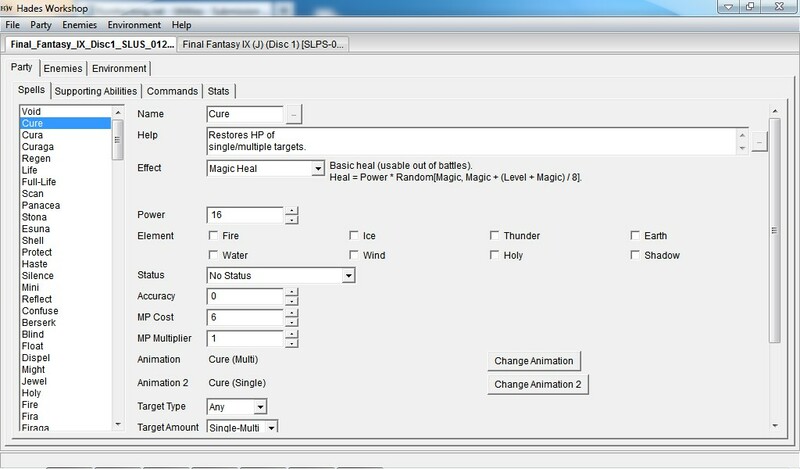 This is a tool under development aiming to edit the most things possible in Final Fantasy IX. Translation patching : all the texts and dialogs are editable, as well as the charmap (the image picturing letters in-game). The tool can be used with any PSX and PC version and of the game and can transfer datas from a version (or a disc) to another. Save Mod (PSX and PC) : save the game datas and the modifications inside a file that can only be read by Hades Workshop without modifying the game’s disc image. This is the most preferred way of saving modifications when you don’t want to apply them at once. Export as PPF (PSX) : basically does the same as makeppf.exe (only faster) : create a PPF3.0 file that can be applied to a disc image using the appropriate tool. You should never use this method if the file on your hard disc has been altered (using Hades Workshop or any other tool). This is the most preferred way of saving when you want to share your modifications. Overwrite Binary File (PSX) : save the modifications inside the disc image for a ready-to-go game. The modifications can not be undone. This is the most preferred way of saving when you want to test your modifications and have a backup of the original file. Save Steam Mod (PC) : duplicate the Steam files and apply your modifications to the duplicate. Replacing the Steam files by the created ones will enable the changes. The code source is also available : it’s C++ developed with Visual Studio 14, the GUI utility wxWidgets and the GUI helper wxFormBuilder. It also depends on OpenGL and the Autodesk FBX SDK library.